Citation Information: JCI Insight. 2017;2(19):e92232. https://doi.org/10.1172/jci.insight.92232. Pancreatic ductal adenocarcinomas (PDAs) are desmoplastic and can undergo epithelial-to-mesenchymal transition to confer metastasis and chemoresistance. Studies have demonstrated that phenotypically and functionally distinct stromal cell populations exist in PDAs. Fibroblast activation protein–expressing (FAP-expressing) cells act to enhance PDA progression, while α–smooth muscle actin myofibroblasts can restrain PDA. Thus, identification of precise molecular targets that mediate the protumorigenic activity of FAP+ cells will guide development of therapy for PDA. 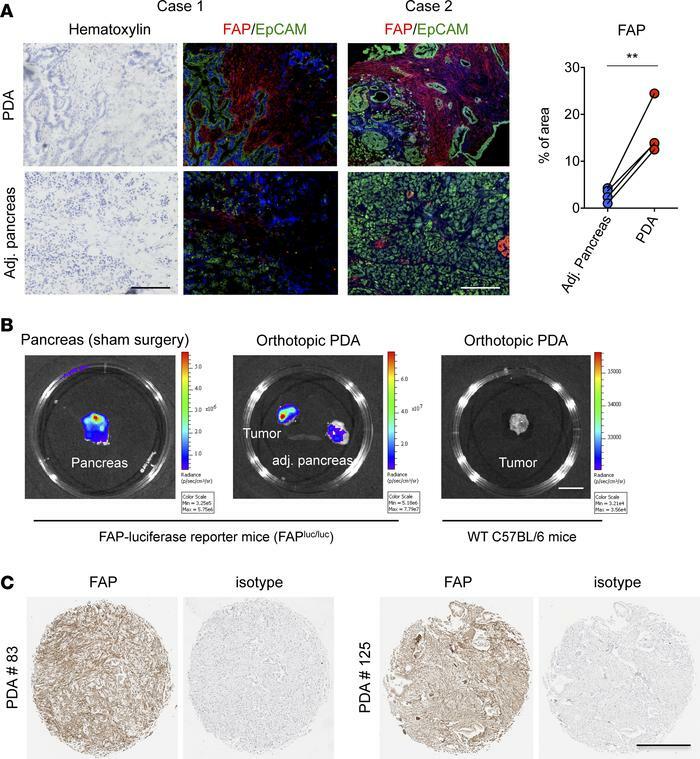 Herein, we demonstrate that FAP overexpression in the tumor microenvironment correlates with poor overall and disease-free survival of PDA patients. Genetic deletion of FAP delayed onset of primary tumor and prolonged survival of mice in the KPC mouse model of PDA. While genetic deletion of FAP did not affect primary tumor weight in advanced disease, FAP deficiency increased tumor necrosis and impeded metastasis to multiple organs. Lineage-tracing studies unexpectedly showed that FAP is not only expressed by stromal cells, but can also be detected in a subset of CD90+ mesenchymal PDA cells, representing up to 20% of total intratumoral FAP+ cells. These data suggest that FAP may regulate PDA progression and metastasis in cell-autonomous and/or non-cell-autonomous fashions. Together, these data support pursuing FAP as a therapeutic target in PDA. FAP is overexpressed in human and mouse pancreatic ductal carcinomas. (A) Human PDA and adjacent normal pancreatic tissues were subjected to hematoxylin and immunofluorescent staining with FAP and EpCAM. Scale bar: 100 μm. FAP is highly expressed across the whole tumor tissue compared with the adjacent normal pancreas (n = 4). **P < 0.01 by Student’s t test. (B) FAP luciferase reporter knockin or WT C57BL/6 mice were orthotopically implanted with syngeneic PanO2 PDA cells or serum-free medium (sham surgery) in the tail of the pancreas (n = 2). Tumor and adjacent pancreatic tissues were harvested and subjected to bioluminescent imaging. Scale bar: 1 cm. (C) Analysis of FAP expression using human PDA tissue microarray. Scale bar: 400 μm. PDA, pancreatic ductal carcinomas.